The photo above was taken looking North from the hillside above the highest portion of Haselbachgraben. The farms lie in the watershed of the Haselbach, not the Grestenbach. Also in the past, I believe both farms lay on the south side of the main road. Just up the road to the right would be the Sonleiten Farm. The Haselbach Farmstead is that just to the right of center. 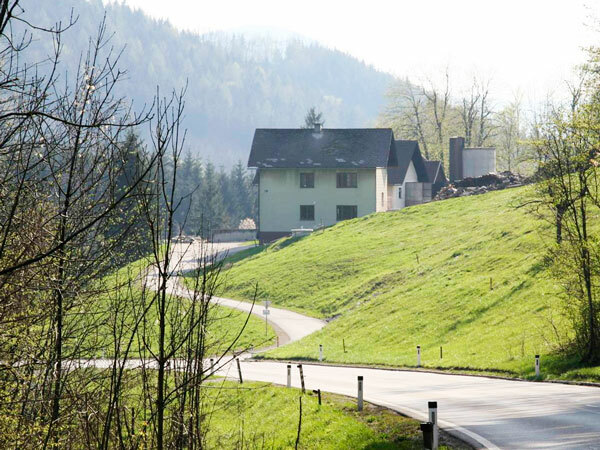 (I believe that the next farm over to the left, and a little higher on the hill, is the Gabelslehen farm-- also associated with the Hasselbachers.) Strictly speaking, the Haselbach farm is currently in the district of Ybbsitz, but in older maps both of these farms appear to have been part of the Gresten Parish. 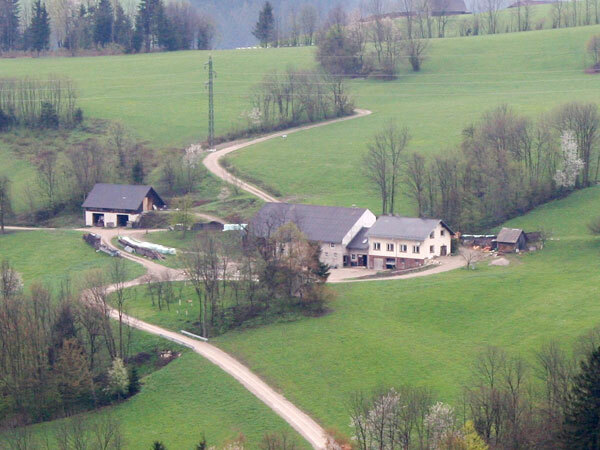 In the past, the Haselbach Farm also appears to have been in the district of Obergut rather than Schaderampt. The history of the boundaries of these municipalities and locations is not known to me. I am told that Ybbsitz did not become Protestant in the way that Gresten did and did not experience the same disruptions of the Counter-reformation. Some day someone needs to look at the church records of Ybbsitz to see if any of our ancestors remained there. On old maps, a farmstead called Ober Haselbach can be found. 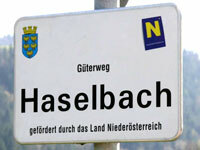 This caused me some confusion, but I now believe "Ober Haselbach" and "Haselbach" to be the same location. 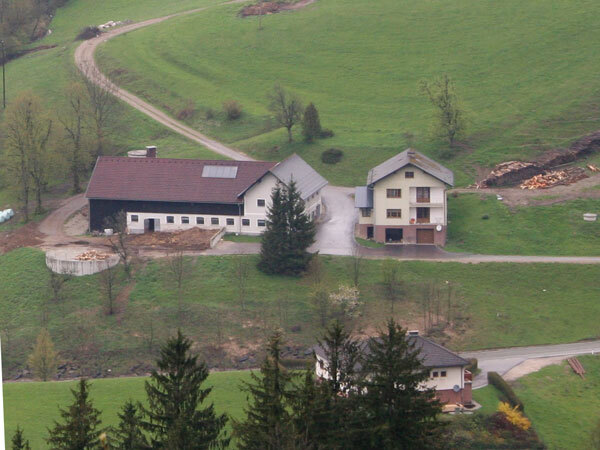 Just below Is a view of the house looking down from the crest of the Graben. It was raining that morning so some of these photos are grayish. 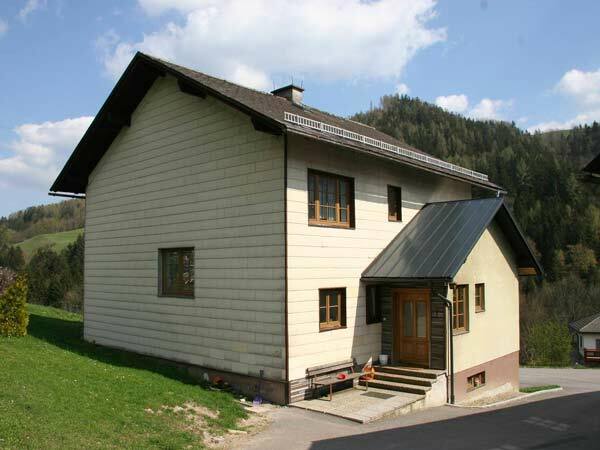 The small house on the other side of Road 22 is an exception to the observation that there are not many new houses. I met the lovely lady presently living here. I do not think we are related but have no specific knowledge. This is the view of the upper Haselbach watershed seen from the Haselbach Farm.